Tomorrow is our statewide Chipotle Mexican Grill fundraiser—every Chipotle in Maryland is donating 50% of their sales back to the Maryland SPCA! 1. Eat at any Maryland Chipotle restaurant on Thursday, September 29, during their opening hours of 11 a.m. to 10 p.m.
2. EAT IN: Mention that you are supporting the Maryland SPCA when placing your order. CARRY OUT: If ordering online, mention that you are supporting the Maryland SPCA in the special instructions box. 4. 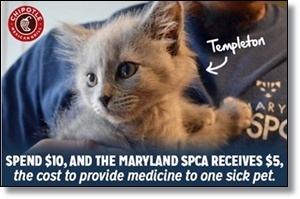 Share our Chipotle Facebook event - and indicate that you are "going"
Help us make Cause an Effect - Chipotle Fundraiser for the Maryland SPCA a HUGE success for homeless animals!